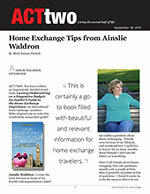 AINSLIE WALDRON INTERVIEW ACT TWO: You have written an impressively detailed travel book, Luxury Globetrotting on a Staycation Budget: An Insider’s Guide to the Home Exchange Experience, on international home exchange vacations. 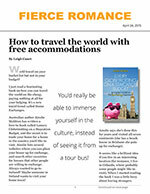 What inspired you to write this wonderfully researched guide? You see the lifestyles of the rich and famous on the television every day. And while you want a piece of that (who doesn't? 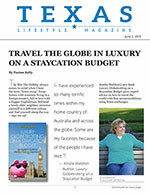 ), your family budget just doesn’t allow for the kind of luxury you'd like; or does it? You might be surprised at just how well you can live on very modest means. 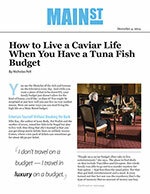 Here are some ways you can start living the high life on a Main Street budget.